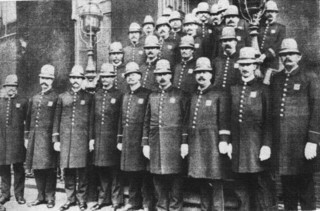 Members of the NYC police force in 1895. Of the 12 Jewish policemen selected by Roosevelt to protect the rights of free speech was the playwright's great grandfather. Maria Paradeis holding up a candle to view herself in a mirror for the first time. Commissioned by Theater J, Washington, D.C. this play is a recipient of a grant from the National Foundation for Jewish Culture. The play takes place in 1895 when Theodore Roosevelt was Police Commissioner of New York City. Herr Ahlwardt, a rabidly anti-Semitic member of the Reichstag came from Berlin with the announced purpose of “preaching against the Jews” and he demanded protection. Roosevelt assigned a group of Jewish policemen to be his bodyguards and protect his right to freedom of speech. THE VISITOR is about these policemen, this historical event and its significance. A two act, dark but highly entertaining farce about a voracious, hi-tech, multinational corporation called G.E.T.G.O. 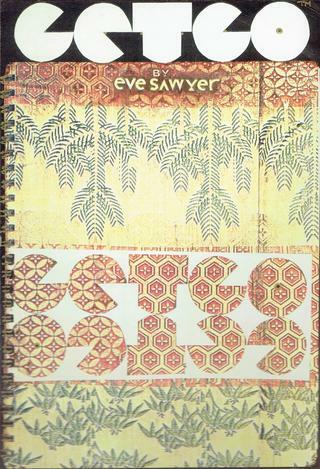 (an acronym that changes meaning often) and a painter EVE SAWYER (the protagonist and the pseudonymous author of the play) who comes to protest its destructive activities and gets trapped inside the labyrinth. The entire play takes place in corporate headquarters where G.E.T.G.O. 's first annual art exhibit is being held. When the audience enters the lobby, they enter G.E.T.G.O. 's game and when they leave, the world will never seem quite the same again. Like EVE, they discover they can’t get out. The play is based on a real incident. 2 MEN, 2 WOMEN. SET is done with projections. Tony Walton has directed readings at New Dramatists, Irish Repertory Theatre, Williamstown Theater, and a staged reading at the John Drew Theater at Guild Hall, East Hampton, N.Y.
GETGO (called THE GLEAM) won a place of 3 plays selected from 250 submissions at the Telluride Playwrights "Politico Plays" Festival. Kenneth Spiers, THE MAIL ON SUNDAY. WITHOUT A TRACE is a two act play about the tragic relationship of the charismatic Dr. Franz Mesmer and his famous patient, the blind pianist, Maria Theresa Paradies (for whom Mozart wrote the 'Paradies Concerto'). The scandal that drove Mesmer out of Vienna and then Paris and drove Maria back to blindness is the hub of a battle between the forces of mechanistic science and the insightful vision of the artist. The play begins at the “Concert of the Blind Pianist”, April, 1784 in the Tuileries, Paris, where Mesmer's trial is conducted by Benjamin Franklin and moves into the memory of its star witness: MARIA Paradies and her experiences in the cruel world of Vienna where she briefly regained her sight. 5 MEN, 3 WOMEN. Unit set, minimal scenery. It is the title play of the four award-winning plays recently published. 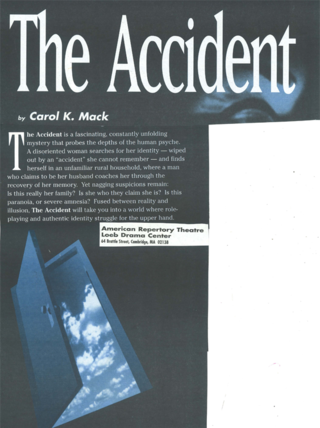 The Boston Globe called Carol K. Mack's play, THE ACCIDENT, "Gripping!" and the Patriot Ledger: "Powerfully captivating!" "Once in a very great while, a new play comes along that is genuinely new. A script that finds an original way of approaching questions which have been chewed over perhaps many times before. 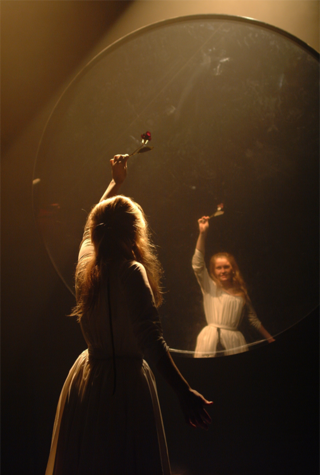 A play that presents us with a freshly and deeply imagined vision. Seeing such a play, we have the sense of suddenly looking out over new terrain; a new part of our collective psyche falls into place. "The Accident" by Carol K. Mack, which is receiving its world premiere production by the American Repertory Theatre in Cambridge, is such a play. The comparisons here are to Pinter and Beckett. This is a challenging, fascinating, elliptical play...It is stunning and inexplicable in its power." It is included in the new anthology WITHOUT A TRACE & Other Plays. Carol K. Mack's plays also include: TERRITORIAL RITES, POSTCARDS, ESTHER, and A SAFE PLACE which have premiered respectively at: The American Place Theatre, Ensemble Studio Theatre, The White Barn Theatre Foundation, and The Berkshire Theatre Festival in Association with The Kennedy Center for The Performing Arts. She is the recipient of a Stanley Award, a Beverly Hills Theatre Guild-Julie Harris Playwright Award, a Playwright Forum Award, & a residency at the Rockefeller Foundation Center at Bellagio, 1995. Her work appears in THE BEST AMERICAN SHORT PLAYS of 1986, 1990, 1994, and 2007, and in various other publications. See the About page. 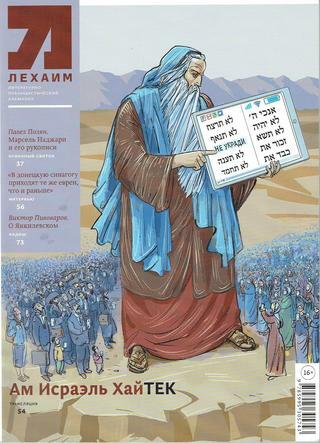 My short story "The Chosen People" which was originally the recipient of a Literal Latte Fiction Award and published in Moment Magazine was translated into Russian by Vladimir Lazaris and published in a Moscow based Jewish magazine LECHAIM.